Congrats rachelegolden@gmail.com!! You are our winner! Check your email! This month we are excited to team up with BabbaCo for a special giveaway just for our fabulous Toddler Approved Readers! If you're not familiar with BabbaCo and their monthly BabbaBoxes, check out BabbaBox: A cool learning tool for kids! I have been working with BabbaCo for quite awhile now and I have to say that every month I think the boxes get better and better! The crafts and activities in the monthly boxes just get more creative, engaging, and fun. I also LOVE the children's book that is included in each monthly box. The October detective box might be my favorite yet! Are you as excited as I am about this special giveaway? A FREE Annual BabbaBox Membership (valued at $299.99) AND a $250 gift card to Target! This giveaway is open for entry from Monday, October 22nd to Wednesday, October 31st. BabbaCo will email the winner on Thursday, November 1st (and I will also announce the winner on this post). Giveaway is for US Residents only. When you enter the giveaway, please leave a comment on this post letting me know what themed BabbaBox would be a hit with your child. What is your child's favorite thing right now? Space? Dinosaurs? Princesses? Tell me! I'd love to know! If you aren't already part of the BabbaCo and Toddler Approved communities on Facebook and Twitter, come join in! Click on the links below and "Like" us or "Follow" us. Next week I will be sharing my usual monthly BabbaBox Book post. It will be detective themed. Get excited! If you don't win this giveaway, no worries... you can still use this special code to get 20% off your first BabbaBox: Use TA20OFF at checkout. Disclosure: This is a co-branded giveaway with BabbaCo.com. 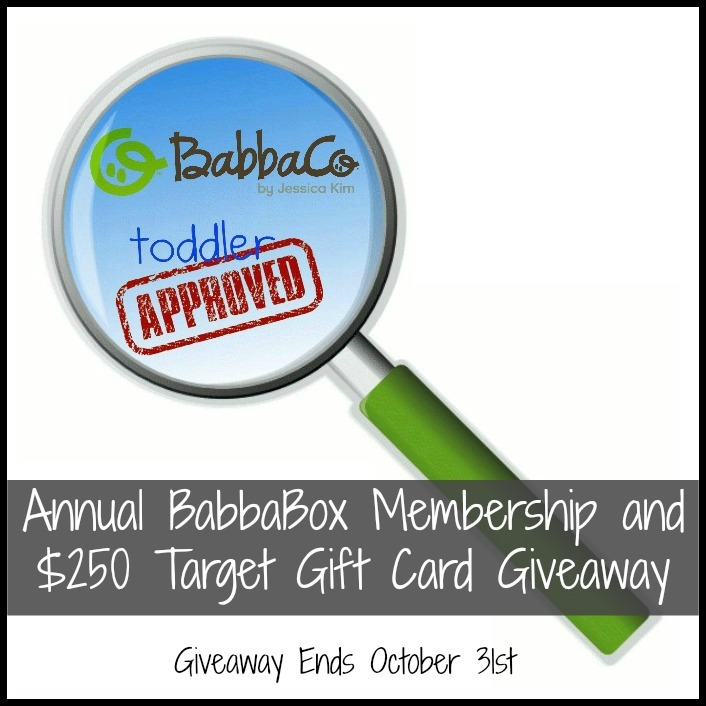 BabbaCo will be compensating me for this post and will be providing the Target gift card and Annual BabbaBox membership to our giveaway winner. All posts reflect my personal opinion and endorsement and are not swayed by compensation and/or free products. Please note that this post reflects my opinion and preferences and you might not share that same opinion. My almost 4 year old is just now getting into princesses. She already is into Dora in a big way and dance (ballet shoes, tap shoes, tutu skirts, etc). She loves markers - not crayons - and anything that involves scissors and glue. My 3-year-old really likes animals right now - especially dogs. He also loves anything that involves glue! The BabbaBoxes sound great and what an interesting name. Any idea how they came up with it? My son would love Babbaboxes on: 1) Minecraft 2) Dinosaurs 3) Cartooning 4) Graphic Novels 5) Ninja. He just turned 8 and is in 2nd grade. He's been reading Diary of a Wimpy Kid series, picture books, and now lots and lots of graphic novels. My boys love the moon and space right now. They love looking at the "twinkle stars" at night! My 5 yo is into rockets/space, although his latest idea is setting up his own fair/carnival in the yard. That might make a fun box theme. My 3 yr old would love this detective themed box, she's been walking around the house for 3 weeks with a flashlight looking for clues! She has many other interests as well, so I'm sure she would enjoy any of the wonderful boxes. My son would love anything transportation themed. My little girl would love anything sparkly! detectives would be a hit here too...my oldest is really interested in Titanic right now and anything Lego related is always a hit, and my two youngest like Dinosaurs and Birds. My daughter is really liking animals right now. She likes animals of all kinds, but especially like animals from the zoo (monkey, rhino, etc). My tot would love a fairy themed Babba Box! Forests! Fall has been an exciting time of learning for us. After seeing one of your posts on BabbaBox, I knew it would be the perfect Christmas present for Ben. He goes in and out of interests; never really obsesses over anything in particular, but loves to craft! My son loves Airplanes and transformers and thunderstorms. LOL he's eclectic! :)He does LOVE the detective one we just got, he can't put down the magnifying glass! My 4 year old daughter loves princess and anything with space. My little boy loves trains, cars, and things that go. I think you could do a great box full of fun activities with that kind of theme. My son loves dinosaurs, bugs, things that go (especially trains). My son is VERY into anything with a motor, or pet related. I love these themed boxes, I am always looking for creative ideas and learning tools for the kids, it would be AWESOME to have them delivered to my door! Ocean creatures are my kids' current favorite! My kids love animals and art. They also seem to love miniature things. So something where you make miniature animals would probably be a big hit. :) I am so excited about this giveaway!!! What a great giveaway Kristina! We love learning and creating with pretty much any thing. Princesses, Insects, Pirates, Mermaids they are all current interests. My 4 year old is really getting into princesses and pirates!! She also loves arts and crafts, so I am excited about this giveaway!! My girl loves dinosaurs! Thanks for the giveaway. I am crossing my fingers that I win! Thanks so much! My kids are loving spy things right now! My boys are into wildcat's right now leopards, cougars, lions, linx you name it! This looks great, I have never heard of them!! A Things that go theme (like trains, planes, cars and boats) would be an awesome theme for my two boys!! My little guy would be into a space theme. He's fascinated by the moon and stars. My two year old loves animals - farm animals, zoo animals, pets, you name it.